I am still buzzing from last night’s high… the high of participating in live collaborative performance art. 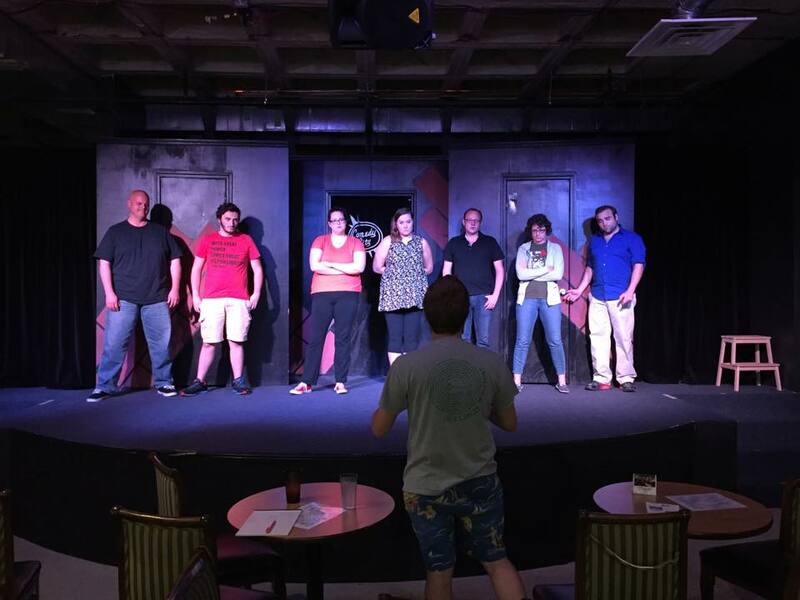 Our First Friday “Harold” show (a traditional improv long form) at Comedy City was such a pleasure I feel inspired to reflect and share. It IS addicting and I want to do it again soon. Yet it is not the desperate and hollow feeling one might associate with a compulsion such as drinking, smoking, or gambling… or drinking AND smoking WHILE gambling. Not an over-indulgence which can never be satisfied. It is more like a calling, an inner urge to reactivate that which was so freshly activated. I want it and perhaps need it, but I can wait patiently and savor it until the next opportunity comes along. What a rush it is to anticipate any type of performance. To know you will be getting up on a stage in front of people… People who are blatantly sitting there expecting you to speak and move around in a way which amuses them. This is, as one of my cast mates says, terrifying! But it is free of the dread or suffering of forced public speaking. Consider the fear you probably know if you have ever been made unwillingly to give a presentation to classmates or coworkers. It is more like the thrill (I would imagine) of bungee jumping. It is a reminder we are alive here and now, participating in this amazing show called LIFE! It does not always happen, but I am grateful when it does… the experience of liberation through play. As it did last night I was once again in the moment, present and awake. Free of analysis and second guessing. In Buddhist terms this could be described as equanimity through mindfulness and nonresistance. In the flow of the universe expressing. Not using acting to numb out from life, but fully feeling and being it. We ARE the act of creativity itself. Most of all I am grateful for the chance to co-create with such lovely people. We share a safe, and dare I say, sacred space. In these moments I find myself filled with admiration and appreciation for each of them. I am amazed at how skilled and talented my teammates are. How generous and supportive the audience is. We are able to come together and free ourselves of ego and personality. To dissolve the illusion of separation. All are connected: actors and audience, thoughts and words, art and those creating it. All are one. This is truly what I like to call experiencing the Oneness through the Fun-ness. Wouldn’t you love a team (of employees, performers, or players) you could totally trust? If you had people who were responsible and motivated to do their part without you keeping an eye on them, then you could probably give them some space. Sorry, it doesn’t work that way.